Aaaaaaaaaaaaaaaaaahhhhhhh I'm so excited for the clinic this weekend I can't take it! 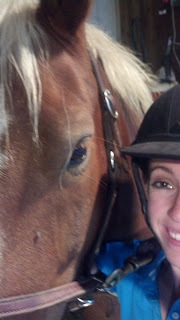 Connor and I had a fantastic lesson tonight. He finally knows the shoulder-in square groundwork exercise well enough that she taught that to me, and then we did a short lunging session in which she really had me work on sending the shoulder out and getting him to bend through the ribcage. It's funny, all of my problems with my upper body under saddle directly translate when I'm lunging him. I am continually astounded by how identical good lunging and good riding is. Then, we had what I would call the first semblance of a normal lesson we've had in quite a while. In the beginning, he gave me some of the best walk work I've ever gotten out of him, and we continued to work on square halts. At the trot, she had me do an exercise that proved extremely effective at getting him balanced and in both reins equally. We started by doing M-X-F and K-X-H loops (and switched directions regularly), and after we were doing well with that, she had us add a 10m circle at X before continuing with the loop. If he wasn't paying attention to my outside aids, was leaning on the left rein, or was not as balanced as he should be, it was 1) difficult and 2) ended with me letting him run into the wall (only if it was in fact his fault for not listening, and not mine for not using my aids effectively). 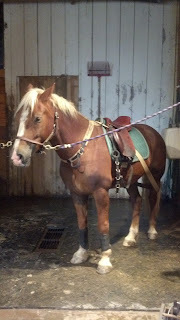 We saw some real improvement with that exercise, and ended when we had a balanced horse moving nicely through his back. Despite the fact that we have only jumped once since the May Cathy clinic, I think she's going to see a ton of progress in our jumping. As my trainer said tonight, he's not doing more advanced movements, but he is moving in a much more advanced and educated way, and therefore she is very curious to hear what Cathy has to say about him this time. We are getting closer to having the pony we need in order to begin those more advanced movements, and since we are getting back to the indoor, which is a proper Dressage arena, I think this winter will see us tackling them for the first time. Conner is so cute. Have I mentioned that reading your blog makes me want a welsh cob that much more!? I like that exercise - adding that to my list! Excited to hear how your lesson goes in the clinic - will you have video? Alanna - my evil plan is working! Ha ha! Seriously, they are some of the coolest, hardiest and most flashy horses I've ever worked with. Connor's breeder's website is http://www.castleberrycobs.com if you want some eye candy! Kelly - I am not sure on video. I'm hoping to hand my DSLR and cell phone off to some of the auditors (auditing is free if you are not busy on Sunday!) so I can get something, but I don't have a friend coming with this time so I'm not sure. They do have beautiful horses. It's probably a good and bad thing that they are so far away from me. I'm sure you have heard of North Forks Cardi...he competes here in the Northwest and I have gotten to watch him a few times. I would LOVE to have one of his kids, but they tend to be out of my price range. I am still kicking around the idea of breeding him to a TB mare, but that would be a ways down the road and I think it would be cool to have a purebred.